When you’re handling cattle, there are a few things that you need to remember. They’re a lot bigger than you, a lot stronger than you, and they can move a lot faster than you. That’s why it’s so important to handle them safely. Some people never learn how to do that, and they usually end up paying the price in one way or another, in the form of injuries either to themselves or to the cattle. Safe cattle handling is a skill. Some ranchers seem to be born with an instinctive knowledge of how to work around cattle, but they’re very much in the minority. Unless you’re one of those very rare “cattle whisperers,” you need to learn your way around these big bovines, and most of the time you’re not going to learn the ins and outs of safe cattle handling overnight. It takes time, experience, and usually a few mistakes. If you’ve ever watched a really skilled cattle handler, you’ve probably observed that they know a lot about how cattle behave, and they base their cattle handling actions accordingly. They work quietly, usually move slowly, and they don’t shout at the animals or at other handlers. They know that in any given year, approximately 10% of cattle handlers are injured on the job, and that good safety practices are the way to avoid injury. It also makes it easier to get things done, because usually, the safest way of doing something is actually also the most efficient way. In order to maintain top production standards, ensure the well-being of your herd, and avoid being injured, follow these five important cattle handling tips. This really can’t be stated often enough. It’s the number one thing you can do to make sure that you’re safe. Cattle are not, generally speaking, dangerous, unless they become alarmed or overly excited. They’re also very much creatures of habit, and don’t like change. If you’re moving the cattle from one point to another, make sure to give them enough time to get used to their new surroundings. Usually if a cattle handler gives them about half an hour, they’ll be considerably calmer and easier to work with. We’ve already mentioned that good cattlemen don’t shout. Speak calmly, and speak often. There are a couple of reasons for this. First, a calm, self-assured voice lets the animals know that everything’s fine, and there’s nothing to worry about or stress over. Second, cattle don’t see the way we do. Since their eyes are on the sides of their heads, they have an amazingly wide vision range, but their depth perception isn’t all that good. And of course they can’t see what’s behind them. What that means is that if they perceive movement behind them, or to the side, they can spook. If they hear you, though, they know where you are. This might sound somewhat counter-intuitive when it comes to handling cattle, since we’ve already talked about the importance of keeping the cattle calm. But sometimes you have to, as Teddy Roosevelt once said, “Speak softly, and carry a big stick.” This doesn’t mean that beating your animals is going to make them more cooperative – it’s all in how you use it. A length of alkathene pipe (sometimes referred to as a “waddy”) or a long stick can go a long way when it comes to handling cattle and ensuring your safety. This is because cattle see you in one of three ways. You’re either a predator from whom they need to escape, nobody of any importance at all, or someone who is powerful and deserving of respect. It’s obvious which of the three you want to come across as, so you have to approach cattle with confidence and authority. If you face cattle with the stick outstretched, you’re presenting a positive, dominant image, stating with your body language that you’re someone who has to be obeyed. Of course sometimes you’re going to encounter an animal (usually a bull) that’s giving you the evil eye. When that happens, you can often defuse the situation by lowering the stick and turning sideways. Of course if the evil eye morphs into genuinely bad intentions, a good, solid whack across the snout can work wonders. We should offer a few words about bulls specifically. They’re the animals most likely to hurt you, and yet it’s surprising how many ranchers lose sight of that fact. Maybe it’s a case of familiarity breeding contempt, but trusting a bull is a huge mistake. They especially can’t be trusted in breeding season. Bulls also tend to become more dangerous the older they get, and a bull that’s kept in isolation is more dangerous than one that’s been allowed to mingle with the herd. Never, ever, work bulls on your own or along with other bulls. Never turn your back on a bull. Keep in mind that when a bull goes quiet, that’s usually when he’s gearing up to give you some real grief. This is pretty basic, but especially important if you’re moving into a yard that hasn’t been worked before. Always do a visual check, and then a bit of housekeeping. Get rid of any loose wire, stray posts, or nails that might be sticking up, big stones, and any containers that could be tripped over. Make sure that all the gates latch properly, and can be opened and closed with a minimum of effort. 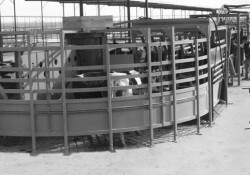 Also make sure that the feed bunk access is adjusted to the right size for the cattle, and that it’s working smoothly. If you’re not at the top of your cattle handling game, that’s when you’re most likely to get hurt. If you’re feeling sick, or you’re working through an injury, there’s no shame in asking for help. Don’t try to handle cattle on your own when you’re not fully present – that’s how you end up among the 10% injured. 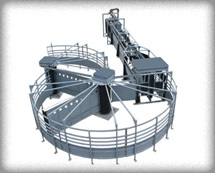 As a final word, we can’t overestimate the importance of a quality cattle chute. The A.L. Silencer is one of the best on the market, and one of the safest means of handling even the most difficult animals. Call A.L. in Texas at 817-736-6920, or in Nebraska at 308-215-0258 to talk about the safest chutes available for you and your cattle.